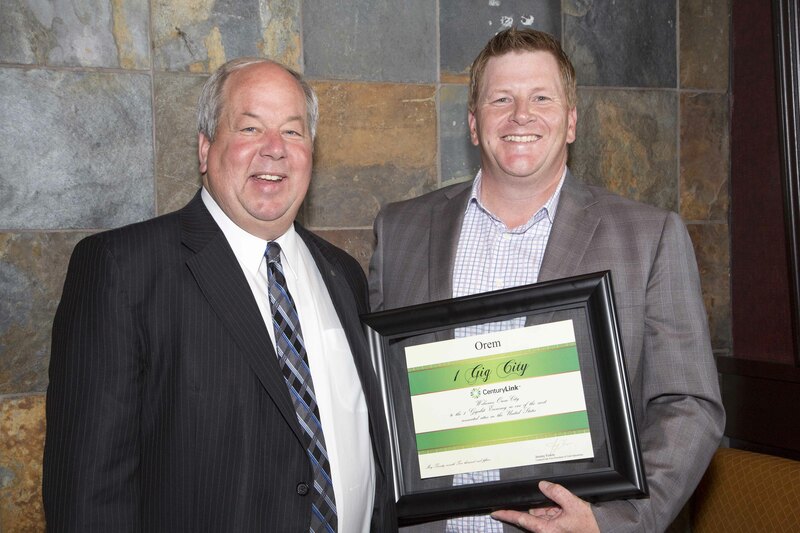 CenturyLink, Inc. today announced the availability of symmetrical broadband speeds of up to 1 gigabit per second (Gbps) for select Orem businesses and residential developments. By extending Fiber-to-the-Premise connections to Orem business locations, the company has scaled its fiber network to offer competitive pricing on IP-based fiber bundles that converge data, Internet and voice service. With 1 Gbps speeds, residential customers will be able to stream high-definition video content with little to no delays and download movies, songs and TV shows in seconds. Customers who have multiple devices connected to one Internet connection in the home will have more than enough capacity and speed to support other uses of broadband such as online gaming, home automation, and increasingly important cloud services. CenturyLink’s fiber-based business solutions are flexible and agile to support a business as it grows by enabling employees to work in the cloud, share multimedia files, stream video content and back-up data in real time. CenturyLink’s symmetrical upload and download fiber speeds of up to 1 Gbps outperform the slower upload speeds available through basic business broadband providers, including many cable companies. This 1 Gbps service offering in Orem expands CenturyLink’s 1 Gbps footprint beyond Salt Lake City and its surrounding communities, where service for business and residential customers launched in 2014.
Business customers can visit www.centurylink.com/saltlakecity to learn more about CenturyLink’s fiber-based services, including speeds up to 1 Gbps, and to determine if service is available in their location. For more information on residential gigabit service and to find out where these speeds are available, customers can go to www.centurylink.com/gigabit. Orem, Utah. April 3, 2015 McNeil Printing has announced the appointment of Jared Combs, Jeff Conley and David Pollard as Senior Account Executives to their newly-formed sales team. We are delighted to have the expertise they bring to our company so we can provide excellent products and services for our clients. With over 20 years of experience McNeil remains a leader in both quality and service. With the addition of new digital equipment, offset and large format capability McNeil leads the way in ‘Making it Happen’ by meeting the growing demands for creative solutions and service. The team brings over 50 years of print experience that our clients will come to rely on for direction and support for their projects and events. Jared Combs has been with McNeil Printing for more than 20 years. He has worked in all areas of print production including offset, digital and large-format graphic displays. Whether providing innovative solutions to meet unique customer requirements or just handling the basics of the modern quick-turn, Jared’s focus on service is the reason his customers depend on him. Jeff Conley has 20 years of service in the print industry that includes sales and management along with expertise in digital and offset printing. Jeff’s clients are loyal and depend on him to help them respond to their fast paced business needs. “Working with clients gives me the opportunity to build enduring relationships” said, Mr. Conley, I also enjoy being involved in several community organizations.” He uses the consultative approach to better understand his client’s goals and offer solutions that deliver results. David Pollard brings 11 years of print experience to the team. He spent 8 years in production so he knows what it takes to lead a client through the decision process. Meeting people and customer service is what David enjoys the most about the business. With his production and service background it gives him an edge when it comes to helping his client’s with their printing needs. You can depend on him to deliver what he promises. The McNeil family believes in a simple concept instilled long ago through hard work and integrity…Making it Happen! Over the past 20+ years we've created a unique experience in the printing industry where customers trust us to always deliver the highest-quality work, on time, and at a fair price. Our team is trained to act, not react, to special needs and requests. We simply go to work-finding ways to deliver on our promises-pleasantly and professionally. You have our word. Give us a call and find out why our customers consider themselves 'part of our family.